When you have your racquet strung at TopServe, you are guaranteed that you are getting the same quality service and attention as the world's elite pro players. At TopServe, we have Australia's most experienced and most qualified racquet technicians and stringers. 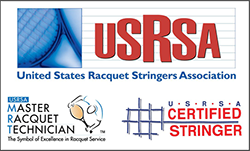 All of our stringers are qualified Master Racquet Technicians (MRT) and Certified Stringers (by the United States Racquet Stringers Association) as well as Pro Tour Stringers (European Racquet Stringers Association) with extensive experience at major tournaments around the world including the Grand Slams. Having your racquet strung professionally does make a difference, so if you are looking to optimise your game, our expert staff will be happy to assist you in selecting the right combination of string and tension according to your personal requirements. We use state-of-the-art stringing machines which guarantees absolute precision and consistency for your restrings and your frame is perfectly protected from any undue stresses during the stringing process. Let our MRTs enhance YOUR game with the right advice in regards to string and stringing, just like we do with the pros! If you find it difficult to get to our store during business hours, we offer a courier pick-up and delivery service with a next-business-day turnaround. Simply call us on 1800 TOPSERVE and we will discuss your requirements in regards to your racquet and string, organise a courier pick-up, string your racquet(s) to your specifications and return it/them by courier within one business day. It's as easy as that! Please note this service is only available for Sydney metropolitan areas at this stage. The courier cost is only $12.00 each way and this cost would cover as many as six (6) racquets in a box. If you are from outside the Sydney metropolitan area and you wish to take advantage of our stringing service, please call and we will work out the most cost effective way to send your racquet(s) both ways.